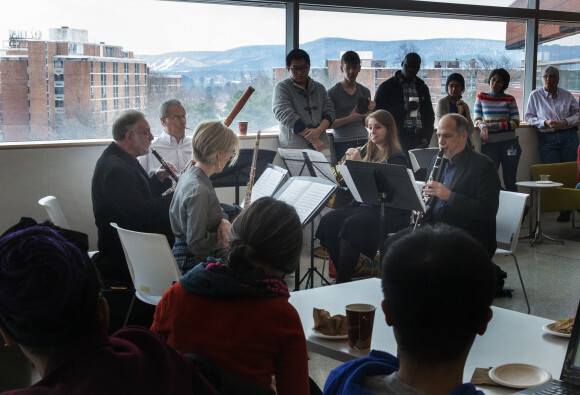 In an effort to bring the arts and the sciences together, the Millennium Café hosted both the Pennsylvania Quintet and geoscientist Richard Alley at this week’s event. The Pennsylvania Quintet Wind Ensemble performing at the Millennium Café on the morning of Jan. 26. The Pennsylvania Quintet consists of Penn State faculty members Naomi Seidman (flute), Tim Hurtz (oboe), Anthony Costa (clarinet), Grace Shafer (horn), and Daryl Durran (bassoon). Despite the fact that the instruments constituting a quintet have been modified since Johann Sebastian Bach’s time (as an audience member pointed out) , the quintet played “Prelude and Fugue in D Minor” (BWV 539) (The Fiddle Fugue) by Bach, arranged by Mordechai Rechtman. 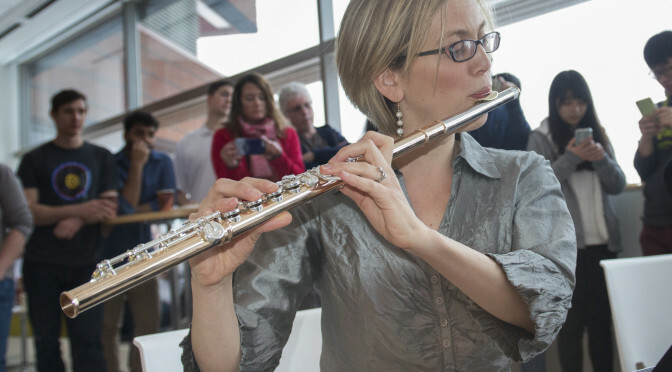 But one of the musicians noted that the piece was originally written for the organ — itself a wind instrument. 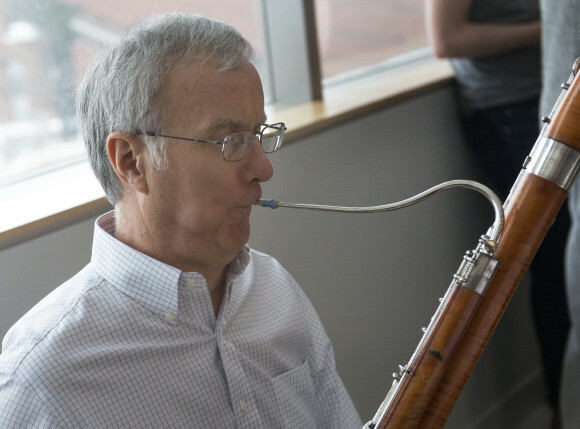 Daryl Durran playing the bassoon during a performance by the Pennsylvania Quintet at the Jan. 26 Millennium Café. Sandwiched between quintet performances, Alley presented his work with the Penn State Ice and Climate Exploration Center. In describing rising sea levels, he compared a glacier to “pancake batter” and the ice cliffs that are formed by retreating ice sheets to a “spatula” that is holding the glacier in place, or keeping it from spreading. If the glacier spreads, the sea levels will rise. The Quintet wrapped up the event with “Seven Aphorisms,” by Philadelphia composer Cynthia Folio. Café organizer Josh Stapleton aims to raise awareness among attendees about what others are studying around campus, as well as providing opportunities to see how others communicate their research. “People in the arts and humanities have an ability to communicate in different ways than those in science and engineering,” Stapleton said. The Millennium Café is held every Tuesday in the Millennium Science Complex. All photos in this post by Patrick Mansell. Previous PostFocus on research: How ‘they’ is causing waves in language and societyNext PostFocus on research: Can I turn down a work assignment that goes against my morals?